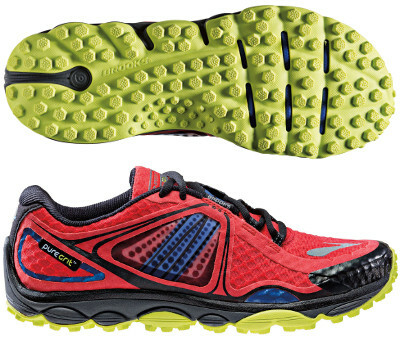 Brooks Pure Grit 3 are neutral trail running shoes. The Brooks Pure Grit 3 is the new model from Seattle's manufacturer for those trail runners who want a lightweight shoe for racing over any type of ground. This new version has been redesigned using latest materials available. BioMoGo and DNA™ in the midsole feature great comfort and cushioning on every stride. Outsole has been updated with multiple hex-shaped lugs for a exceptional grip and traction on all terrains. It also has a flexible full-length rock plate (Ballistic Rock Shield) dispersing the point load pressure from stones, branches, etc. while still keeping the forefoot flexible for a terrain compliant ride. Upper presents a modern and agressive look using a breathable and seamless mesh. Wraplike fit is enhanced by a wide interior arch band (Nav Band) a revised lacing system that keeps the foot secure in the heel and midfoot.